Best Back Acne Men's Body Wash for Men. Daily Body Wash.
• Advanced Acne Pads help prevent and clear acne breakouts. Removes oily residues and buildup. • Daily Body Wash antibacterial body wash for men removes dead skin cells and clears clogged pores and buildup that leads to body acne breakouts. • Buff Body Gloves removes impurities and buildup from pores that can lead to back acne blemishes and breakouts. Easy Application of Back Acne (Bacne) Treatment. Use this convenient acne treatment pads on the back and whole body to completely clear and prevent breakouts. Formulated with prescription-grade, maximum strength salicylic acid (2%). Unique formula also contains glycolic acid, tea tree extract and witch hazel to remove oily residues and buildup, and maintain your whole body clear and acne-free. 50 pads. Men's Bacne Cleanser with Glycolic Acid. 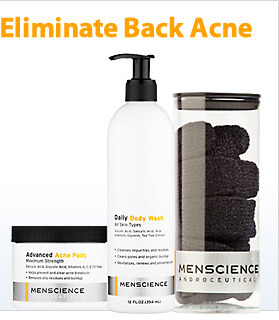 Get rid of back acne ("bacne") with this men's body wash for bacne. It helps get rid of back acne by removing dead skin cells and clearing clogged pores and buildup that lead to body acne breakouts. This is the best cure bacne. Ideal for all skin types and athletic lifestyles. 12 oz. Exfoliating Bacne Gloves Designed to be used with the Daily Body Wash, these innovative micromesh gloves remove impurities and buildup from pores that can lead to back acne blemishes and breakouts. Regular use will leave skin clean, smooth and renewed. Because initial overdrying may occur, start with 1 application daily, then gradually increase to 2 or 3 times daily if needed or as directed by doctor. • If dryness or peeling occurs, reduce application to once a day or every other day. If going outside, allow product to dry, then apply TiO2 Sunblock SPF 30. This product is highly recommended if you are looking for: Acne Treatment, Acne Medicine, Acne Blemish Control, Acne Control, Acne Skin Care Product, Acne Scar Treatment, Causes of Acne, Acne Medication, Acne on Back, Acne Cream, Acne Repair. How often should I use the Advanced Acne Pads? Apply Advanced Acne Pads once daily. Gradually increase usage to 2 or 3 times a day as needed. Because of the high concentration of Glycolic and Salicylic Acids, it may take some time for skin to get used to the treatment. Begin with 1 application daily, then gradually increase to 2 - 3 times daily as needed. Once skin has become accustomed to the treatment, irritation, redness or dryness usually disappears. Why is Salicylic Acid an effective ingredient in acne treatment? Salicylic Acid helps prevent clogged pores by gently exfoliating oily residues and dead skin cells from the surface. By removing this organic debris, new cells are revealed and pores are kept free of acne-causing bacteria. Salicylic Acid also helps smooth skin and refines skin texture. What do you recommend for acne-prone skin? Keep skin clean by washing with Daily Face Wash twice a day, once in the morning and once at night. Apply Advanced Acne Pads to eliminate blemishes and blackheads and clear pores. Apply Acne Spot Repair directly to blemishes to diminish them in 24 hours. Only use products that are non-irritating and noncomedogenic. Do not pick at or pop blemishes, and twice a week, use Microfine Face Scrub to exfoliate skin and unclog pores. Does tanning clear up acne? No, it does not. When you tan, dead cells build up on your skin’s surface. This can often cause pores to seem smaller and the surface to appear smoother. Tanning masks redness caused by acne, but once the tan disappears acne will become apparent once again. Exposure to the sun can also darken acne scars and marks, so protect skin regularly by using TiO2 Sunblock SPF 30 when you go outside. Is acne caused by eating greasy foods? Contrary to popular belief, there is very little scientific evidence to back up this claim. However, you should aim to eat a balanced diet full of vitamins from fruits and vegetables, and drink plenty of water for overall well-being. Powerful professional ingredient prescribed by doctors and skin care professionals for treatment of acne, ingrown hairs, and dandruff, and combating signs of aging. Has penetrating, exfoliating, antibacterial and moisturizing properties. Helps prevent pore-clogging, refine skin texture and remove oily dead organic matter. Also known as a Beta Hydroxy Acid (BHA). Used by dermatologists and skin care professionals to gently shed upper layers of the skin, leading to smoother, softer skin, and a reduction in the appearance of fine lines, dry patches and dark spots. Encourages the production of new skin cells for a fresh, healthy complexion. Multifunctional botanical extract beneficial for skin that exhibits congestion, itching or irritation, or requires help in healing. Has been a preferred medicinal ingredient for Australian aborigines for thousands of years. Credited with antiseptic, anti-inflammatory and healing properties. Has clean, sharp scent similar to eucalyptus or pine bark. Highly effective natural ingredient to treat inflamed skin or when skin healing or soothing required. Ideal ingredient to help recover overstrained skin and in antiseptic or anti-itch formulations. Helps to improve the skin's texture, elasticity, firmness and smoothness. Plays a role in regeneration of skin cells and in anti-aging treatments. Helps protect and repair the skin and improve its appearance due to antioxidant and skin-brightening capabilities. Considered the most important topical antioxidant and free-radical scavenger. Helps the skin retain moisture, and to prevent irritation, reduce fine lines and slow the aging process.